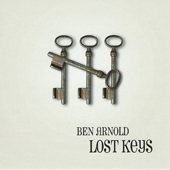 US Rails member BEN ARNOLD is back with a new solo album – Lost Keys! For 25 years singer-songwriter-keyboarder Ben Arnold has been a mainstay on the bustling Philadelphia scene. His career is built on numerous talents: He is a versatile team player in a number of successful bands and a strong solo artist. Over here, we know him mainly as one of the leaders of the mini-super group US Rails which has been touring and releasing albums on Blue Rose Records for six years now. As a solo artist, he has accumulated a back catalogue of seven albums. His last one, Simplify, was his solo debut on Blue Rose and his strongest outing so far. With US Rails taking a breather, he is releasing the follow-up – Lost Keys. Ben Arnold’s career can be traced back to the early 90s when he was gigging in Philadelphia’s coffee house & club scene with his buddy Joseph Parsons and self-releasing his first album (Soar, 1993). With his strong sandpaper voice and wide musical range between Randy Newman, John Hiatt and Bruce Springsteen he became interesting to major labels – his next album Almost Speechless was released in the fall of 1995 on Columbia. Even though it was a professionally produced pop-rock mainstream album, it did not succeed commercially and Arnold retreated into the indie world where he subsequently released the albums In Case I’m Gone Tomorrow (1999), Calico (2004), Solo (2006) and Never Mind My Blues (2007). The Philly-songwriter power pack of 4 Way Street with its focus on CSNY-like harmony-driven folk-rock-pop caused quite a stir. It brought him back together with Joseph Parsons and colleagues Jim Boggia and Scott Bricklin. As a session musician, Arnold also played on albums by Joseph Parsons and Tom Gillam. With drummer Matt Muir he had already collaborated in the indie-rock band Pistol For Ringo. All of these connections led to the US Rails project with fellow songwriters Parsons, Gillam and Bricklin and a slew of releases and European tours. Arnold stands out as the pianist with the immensely listenable sandpaper voice whose contributions are among the highlights of US Rails‘ output. Lost Keys is Ben Arnold’s 8th solo album presenting a complex, convincing set of 10 songs ranging from blue-eyed soul and piano rock to eastcoast-style blue collar rock with ingredients from blues, funk and Memphis pop. This is a mature, relaxed collection oozing experience and musical know-how with its positive groovy vibe. The artist describes Lost Keys as an homage to the golden years of Motown, Stax, Philly soul and doo wop – indeed! Songs like the opener „Stupid Love“ or „One Heart“ with their lush orchestral arrangements recall a River-era Springsteen, 60s Tamla Motown beat and the dancefloor atmosphere of 70s Philly sound at the same time. The funky „Cannonball“ and the energetic „Detroit People“ could have been sung by Joe Cocker in the 80s, „Freedom“ is beautiful crooner soul pop not unlike Michael McDonald and the closing number „When Love Fades Away“ has the groovy DNA of a classic Hall & Oates hit. Ben Arnold’s voice is clearly his strongest asset, at times evoking comparisons to Randy Newman, Billy Joel, Delbert McClinton, Randall Bramblett or even Procol Harum’s Gary Brooker. Lost Keys was produced by Ben Arnold and recorded in various studios in the greater Philly area. The basic band consists of the piano and Fender Rhodes-playing protagonist, Hooters mastermind Eric Bazilian and Matt Kass on electric guitars, Phil D’Agostino on bass and US Rails drummer Matt Muir. Most songs feature strings, horns and/or a typical Philly backing chorus. Additionally colleagues like Scott Bricklin, Zach Djanikian and Kevin Hanson are cast in supporting roles. But Ben Arnold’s amazing voice always takes front and center stage! Kommentare deaktiviert für US Rails member BEN ARNOLD is back with a new solo album – Lost Keys!